Marianina FY is a sans-serif typeface with big characters created by Alisa Nowak & Jérémie Hornus and published by Fontyou that consist 24 fonts, 6 weights and italics, perfect for editorial projects, headline, magazine, newspaper, poster etc. Glyphs: Any Open Type Features, Basic latin/English letters, Diacritics, Currency,Ligatures, Central Europe, Baltic, Turkish, Romanian, Other Open Type, Dingbats & Symbols. 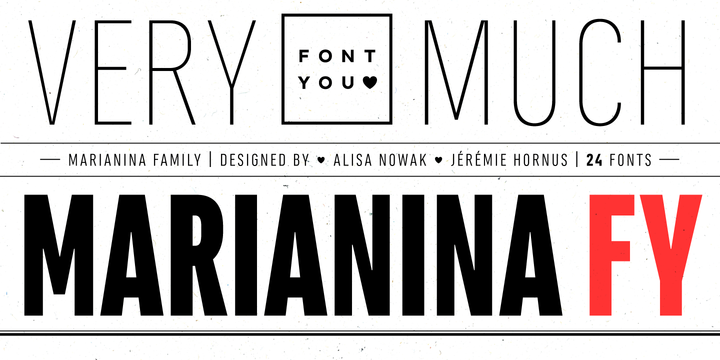 A font description published on Tuesday, November 12th, 2013 in Fonts, Fontyou by Alexandra that has 4,001 views.